Pete Lee’s Narcissus opened to a rammed house on this cold January evening at The Vortex, bringing fire and frenzy to East London. Opening with a recent composition which was still ‘unnamed‘ Pete Lee (piano) started the tune with solo piano. A structurally complex work which integrated solo, heavy groove and ballad vibes, it really showed how many influences this ensemble has. Next up was Mirror Stage which brought tenor player Nadim Teimoori to the stage (we have previously heard Narcissus with Josh Arcoleo). Mirror Stage was a frenzy of sound with beautiful unison lines between Teimoori and Huw Foster (bass) moving on to what can only be described as a meditation of groove. (Pairing of unison lines across different instrument combinations is a delicious Narcissus hallmark). Lee’s solo here was a history of music for the piano, Brahmsian flourishes juxtaposed with contemporary ‘jazz’ harmony, alongside ‘piano basics’ of octaves and fourths. You never knew what was coming next. 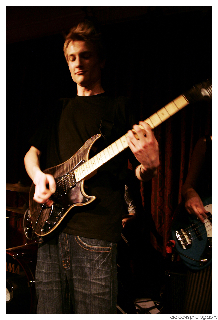 Tom Varrall on guitar demanded attention with a frenetic solo which inspired energy from the rest of the band. With sax returning with the head, guitar continuing soloing and the rest of the band playing a rhythmically displaced groove it was insane controlled mayhem. The colour of the guitar and sax voices blended so well that sounds were interlaced, lost and beautifully fused. Third tune of the night, Criss Cross, moved sound worlds effortlessly, starting with solo bass which we mistook for guitar soloing, such was the lyricism. North African sounding filmic modes then segued into Sci-fi Blake’s 7-esque sounds from synth (a Dave Smith Prophet 12) with further sounds reminiscent of something you’d hear from the early days of the BBC Radiophonic Workshop. Ali Thynne, ever the master at the drums, changed the vibe completely, playing with hands on snare and toms. The tune went everywhere, a tango, sci-fi, romantic piano and then a phenomenal blow by Teimoori which brought the first full audience applause mid-tune. It was fantastic to see how much the band were loving Teimoori’s playing – Varrall especially. We wish we’d taken a photo of his face. Last tune of the night was the familiar Writer’s Block (vimeo below), a great tune which is forceful, angry, melodic with in your face groove. It’s our favourite actually. Lee has a great band: five strong musical characters, each vibrant and individualistic, which he has nurtured to create a phenomenal sound. It’s chaotic, energetic, wild, they’re influenced by jazz, pop, disco, Rachmaninov and Debussy, modes, tangos, electronica – and remarkably it has a beautiful cohesion. Narcissus is sublime chaos, a great schizophrenic identity crisis of genre which against all odds makes sense. Check out the Narcissus website and watch ‘Writer’s Block’ below. To read our interview with Pete, click here. Guitarist Phil Short comes from Buxton, Derbyshire, home of Britain’s favourite bottled water. Currently studying for a BMus(Hons) in Popular Music Performance at the London College of Music, Phil is not only the tallest member of the group, but is also a great showman. Phil is a phenomenal guitar player, playing, amongst many other notable performances, at the Nest Fest in Reading, UK, in 2007 and at the Cavern Club, Liverpool, UK (made famous by The Beatles) in 2009. Phil is also involved with BF’s Educational work – leading groups in our 2009 Arts Council Project Edmonton Flamingos working with inner-city London young people on British Jazz Heritage. However, on a more academic and useless note, his fourth great-grandfather discovered the planed Uranus. Phil also enjoys writing and recording music, watching TV series all in one go…and…no surprises here: eating.